There is an abundance of magnificent architecture built in so many different designs and styles, all with diverse, unique histories and backgrounds. 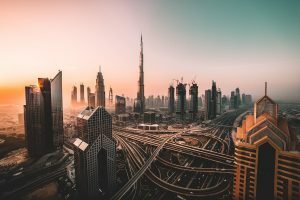 We are going to take a look at just a few of the most popular, impressive buildings from around the world and discover how they were constructed. We will start by looking at the tallest building in the world, the Burj Khalifa located in Dubai. Standing over 2.7k feet high, over 160 stories, this impressively tall structure currently holds seven world records. The foundation of this building is made out of over 110,000 metric tons of concrete and 39,000 metric tons of steel rebar– Laid end-to-end, that would extend a quarter way around the world! The interior of this global icon features glass, stainless steel, and polished dark stone. The travertine stone flooring, Venetian walls, and handmade rugs were designed to portray the local culture. The Taj Mahal, located in India, is known as one of the Seven Wonders of the World! This mausoleum was built in honor of the Mughal emperor’s wife and is made up of the tomb, a garden, and several outlying buildings. The breathtaking central building is the tomb, made completely of ivory-white marble. 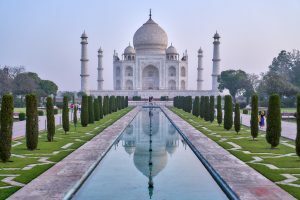 The Taj Mahal portrays a traditional Mughal architectural style and features a lot of hand-carved stone décor on the outside and the inside of the grave features gemstones and ornamental designs on the marble flooring and walls. 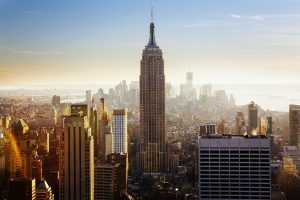 Now let’s take a look a historical landmark here in America: The Empire State Building in New York City. From its completion in 1931 through 1972, this impressive building was the tallest structure in the world at 1,453 feet high. It still holds the 1930s Art Deco design style, but has since been renovated from its original limestone panels to be an eco-friendlier building. The lobby has also been renovated and kept to hold the original Art Deco style. Featured inside are two chandeliers designed from original blueprints from the ‘30s, plus the iconic 15,000 square feet ceiling mural made up of 23-karat gold and aluminum. The final astonishing building we will look at is the Sydney Opera House, located in Australia. This wondrous structure was groundbreaking, as it defined the link between engineering and design. It took over four years to bring the famous spherical roof to realization. 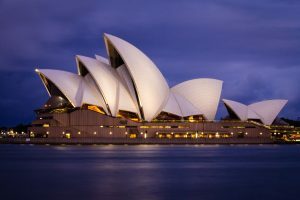 The design was submitted by a man from Denmark to an international competition for the Australian national opera house. The roof consists of over one million specialized Sydney tiles, designed to appropriately contrast with the Sydney Harbour and the lovely, blue Australian sky.